Another summer is here and we at the Cohn Restaurant Group will be tripping on acid all summer long. Come on, get real! We are not Deadheads. I am not talking about Ken Kesey and Tom Wolf’e’s Acid Bus. I am talking about Riesling! Yes, that delicious grape that makes my mouth-water. Riesling has so much acid that it makes me feel nothing but love and peace. After a glass of Riesling, everything is all right. The sky lights up, the stars broaden and spicy food becomes bearable. All summer long, Island Prime, 333 Pacific, Sea 180 Coastal Tavern, 100 Wines and Vintana will be serving at least 3 Rieslings by the glass. Each restaurant will have a special day devoted to Riesling. If you are one of those people who thinks Riesling is just a sweet grape, come on and jump on our bus and we will open the doors of perception. Riesling is probably the most misunderstood grape by the public, yet the most revered grape by professionals. To really see the magic of Riesling, you need to drink German Riesling. To get a high beyond hallucinations, drink dry German Riesling. You cannot explain it, it cannot be put into words. Sure, I can write…”mouthwatering, intense concentration, with a hint of sweet honeyed fruits”, but you will never fully understand it if you don’t inhale. Yeah, this summer inhale Riesling! Snort Riesling! Eat Riesling! There is not a better time of the year to indulge. Forget the summer of ’69, they had it all wrong. They will be making movies about the summer of ’14. It is the summer that Riesling takes over America. During the world cup, put your beer to the side and try Dr. Herman Erdener Treppchen Kabinett instead. While enjoying barbecue during the Fourth of July, try Hans Lang Charta from the Rheingau. While the kids are at summer camp and you get a few hours to yourself, explore Huber Austrian Riesling. When you get back to your towel after a couple of hours of surfing, secretly pop open a bottle of Dr. Konstantian Finger Lakes Riesling. When invited to the many wedding you will attend in August, bring your Barth Sekt and pour it for the toast. 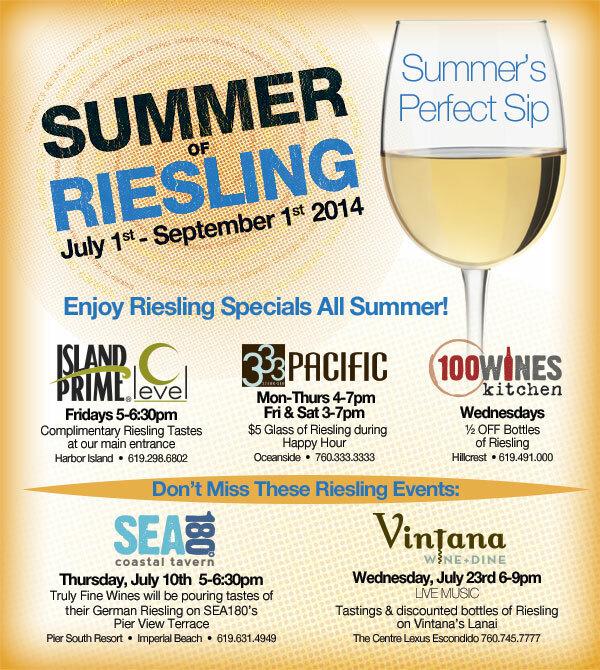 This summer, there is a time and place for Riesling, ALL SUMMER LONG! Last year I was enamored with Riesling that I wrote her a love letter. If you missed it, here it is again. Read it, and drink a glass of Riesling. So let’s get on the Riesling Bus this summer and take the Electric Riesling Acid Test. I want to see everyone tripping on acid this summer. Titled: Luca is bed at home. he rit my gramos blat. He did not tell the trooth. And then she drew to faces with frowns. The funniest part of this letter was that she was so concerned that he had misbehaved on Earth day. These little things bring joy to my life. But what is even more gratifying is when they look up to me and try to copy the things I do. Not long ago, my daughter was sitting next to me while I was sipping on a glass of wine. She wanted to taste it and she put her finger in the glass and took a taste. I then asked her to smell the glass and asked her, “what does it smell like, apples or strawberries?” She said strawberries. I asked “what does it smell like, coconut or cinnamon?” She responded cinnamon. I then asked “does it smell like cranberry or plum?” She responded cranberry. As you might expect, she nailed the wine. It was a red Burgundy and she hit all the aromas. Since that day she is always ready to do the aroma test. I have a mini somm in training. Yesterday, she really wanted to do a commercial for her class. She wanted me to film her as she described the meaning of nature. As you might expect, it was a Saturday afternoon and I was drinking a glass of wine. She grabbed the glass of wine and started walking around the yard telling me what was nature. I was trying to hold in the laughter. She was so serious in what she was doing, and that glass of wine took me over the edge. It was all her idea, I just filmed. The most important bit of knowledge I took from this commercial was that wine is part of nature too. Enjoy. Are Wine Dinners an Exploration of the Scientific Method? Every time I sit and taste with a winery or distributor, they always throw out, “…we would love to do wine dinners with you guys.” Oh, great, another wine dinner! I guess you are probably sensing from my tone that I am not a fan of wine dinners. You would think that sommeliers and chefs love to do wine dinners. And you are right, they do. I just don’t. Before I get everybody up and arms and start calling me out for blasphemy, let me explain myself. Food and wine go together. I have a glass of wine with my meal everyday. I don’t think it should be a big production. I have been to many wine dinners and have left under-whelmed. I get so excited to go to a great restaurant and drink the wines from an amazing winery. However, by the end of it all, some courses worked and others didn’t. Maybe the food was great but the wine did not match. Or maybe it was the wine that was amazing but the food was sub par. I end up leaving full and buzzed, but with out a sense of real satisfaction. Here is why. Restaurants take different approaches to wine dinners. The most common is a winery comes and says “here are my wines, let’s do a wine dinner.” Now the chef should taste each wine and create a dish to pair with the wines. He needs to take acidity, alcohol and tannin into account. Most chefs never taste the wine before they create the dish. And if they do, very few chefs know how to taste wine. So they leave it up to the sommelier. The sommelier knows the wine, but the dish the chef has proposed is not one on the menu. The chef wants to do something special so he hands the sommelier a piece of paper with his proposed dish. Since the chef is busy with the day-to-day operations he probably will never be able to make the dish until the night of the dinner. Therefore, the sommelier has no idea of what it taste like. He sees that the first course is scallops so he uses the winery’s Sauvignon Blanc. The Second course is Wild boar with fig and port reduction, so he picks a medium body red that the winery produces. And the last course is a chocolate pot de crème, but the winery only makes a late harvest Viognier, so he uses that. You can probably see where this is going. This hypothetical wine dinner, is hypothetical in all aspects. Yes, I made it up, but it happens all too often. Both the chef and sommelier are dreaming up pairings. They are using the scientific method to make a wine dinner. They came up with a hypothesis and now they are going to use the guests at the dinner to prove their hypothesis. I don’t want to be the guinea pig when I pay big bucks for a meal. But why does this happen? Well, it doesn’t happen all the time, but it does occur more than it should. Here are the issues. 1) The Chef, sommelier, managers and wait staff are busy running their operation. A one night event can throw off their rhythm. The dishes might have never been made before. The line cooks and sous chefs will be plating something for the first time and who knows if it is balanced or not. The cooks are cooking for the regular restaurant business and for the wine dinner. This causes stress in the kitchen and if you ever watched “Like Water for Chocolate”, a stressed cook could contaminate your food. 2) The sommelier is familiar with the wine but the dishes he is not. He is crossing his fingers hoping that the Yuzu sauce on the scallop dish is not too acidic and praying that it is not too sweet. 3) The winery makes different types of wines, but Cabernet is their flagship. The other varietals are okay, but they aren’t great. The sommelier has to pair one of their white wines, just because nothing else will go with the scallop dish. 4) There is a lot to do for a wine dinner. The restaurant stops seating its normal capacity to make room for a wine dinner. Servers are brought in to serve and they know nothing about the wine or food since they have never seen it before. As you can see, I am not a fan of wine dinners. That being said, I am writing this to invite you to a wine dinner. You must think I have lost my mind. I spent all this time bashing wine dinners and now I am inviting you to a wine dinner. This is different. This is not a hypothetical dinner where we will be putting on our white coats and experimenting our hypothesis. The dinner is not held in a busy restaurant who’s chef is too busy to taste the wine and create the dishes. This is not from a winery that can only make Cabernet. And the dishes are not unfamiliar to the sommelier. 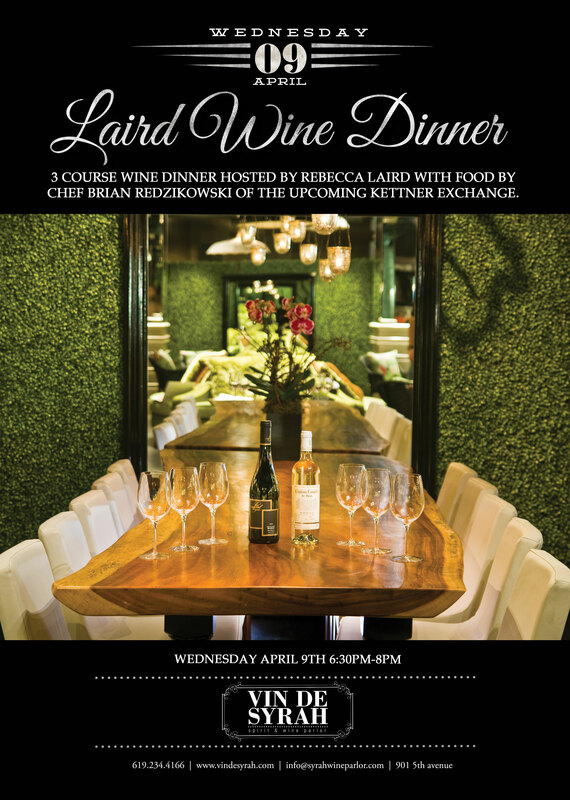 Syrah Wine Parlor will be hosting Rebecca Laird from Laird Family Estates. Chef Brian Redzikowski has developed a menu that pairs excellently with the wines. The best part is that Chef Brian is not working in a restaurant yet, and has had time to develop this menu. Chef Brian is no stranger to wine and food pairing. He has worked in some of the top restaurants in the world including, Nobu Aspen and Las Vegas’ 3 Michelin Star restaurant, Joel Rubuchon’s at the Mansion. Chef Brian was recently at Flavor in Del Mar and is about to open a new restaurant in Little Italy, Kettner Exchange. In the meantime, he has developed his menu at Syrah Wine Parlor. Syrah Wine Parlor is a wine bar/club. This allows the team to transform the space into what one might call a pop restaurant. The chef will only be making dinner for you and not cooking for the rest of the restaurant. What an experience! You will enjoy a handcrafted meal from an Iron Chef competitor and enjoy the wines of Rebecca Laird. The wines are top-notch, the chef is world-class and the space is magical. Just when I thought wine dinners were dead, Syrah Wine Parlor brings you a hypothesis that cannot be disputed. Price of dinner is based on seating preference, call Syrah Wine Parlor for more details. Where do you buy wine? Where do you buy wine? This is a question I always get. And it is a hard one to answer. People want me to name my favorite wine shop in San Diego, unfortunately I don’t have one. I am in a very lucky position. I co-ordinate the wine lists for a group of restaurants. Some of these restaurants have “off sale permits” which allows them to sell wine to go. What makes these restaurants different from wine shops is that the “off sale” is not the means to make a profit. Selling wine at retail is just an extra perk for our guests. How many times have you been at a restaurant and have enjoyed a bottle of wine over dinner. You have decided to skip dessert and instead of going to a bar, you want to head back to your hotel or home. However, you are not quite ready to call an end to the night. You have room for another glass of wine. Here is where we come in. We can offer you that same bottle out the door. The best part is that you have already tasted it and you know what to expect. Okay maybe that is not the best part. The best part is that since we are not in the business of selling wine at retail, but in the “hospitality” business, our main goal is to give guests the greatest experience. Sending our guests home with that bottle at a price where we barely scratch a profit, confirms that the guest will keep us in mind for another visit. There are not a lot of restaurants which have this special licence. I am lucky that the Cohn Restaurant Group has 5 restaurants with this license, Island Prime, 333 Pacific, Vintana, Prado and Bo Beau Ocean Beach. That is 5 locations throughout San Diego County where you can buy wine from the restaurant. Back in 2008 I started hosting Wine Sales at Island Prime. I clear out the dining room and load the tables with wines. One can expect to find over 100 selections. The wines range from Chardonnay to Tocai-Fruliano from Slovenia, California Pinot Noir to Lebanese red blends, from Champagne to Port wines. It really is an impressive sight. These wine sales have gotten quite the buzz. The wine Club, Prime Cru, has gained many followers. The prices are ridiculous! Today we had a wine sale and I know that many of our guests received some amazing bargains. Wines that might normally retail at $45 sold at $25. The choices were huge, the line of people was long and the value to quality ratio was like no other. So when people ask, “where do you buy your wine and what is your favorite wine shop?” I simply say, “Island Prime, 333 Pacific, Vintana, Prado and Bo Beau Ocean Beach. I get to taste the wine and then decide if I want to buy a case! Today we had another amazing wine sale. There was a line of people outside the restaurant at 11:00 am waiting for us to open at 11:30 am to get in to buy Sea Smoke. Just so you know, there are not a lot of restaurants with a line at the door on a Saturday morning waiting to get in. What makes these sales so successful goes back to what I said before, “we are in the hospitality business”. The guests who got there in line at 11:00 were the first through the door. They bought their Sea Smoke and then sat down for lunch. The kicker is this…remember. “we are in the hospitality business”. They got to enjoy their Sea Smoke at the table, corkage-free. Even better, they paid way below standard retail for the bottle. I host these wine sales at two locations, Island Prime and Vintana. I alternate the sales through out the year. So when I need wine, I simply go to my restaurants and buy wine there. These are the best wine shops in San Diego! One can sit at the bar, sample the by the glass list and walk out with a bottle of what they were looking for. If you are ever dining at Island Prime, 333 Pacific, Vintana, Prado and Bo Beau Ocean Beach, ask your server for a bottle to go. When you ask me, “where do you buy wine?” Don’t be surprised if I give a you a restaurant name and not a traditional wine shop. Italy bound, I am in route to Italy, so what better than to re-visit some of my older posts. 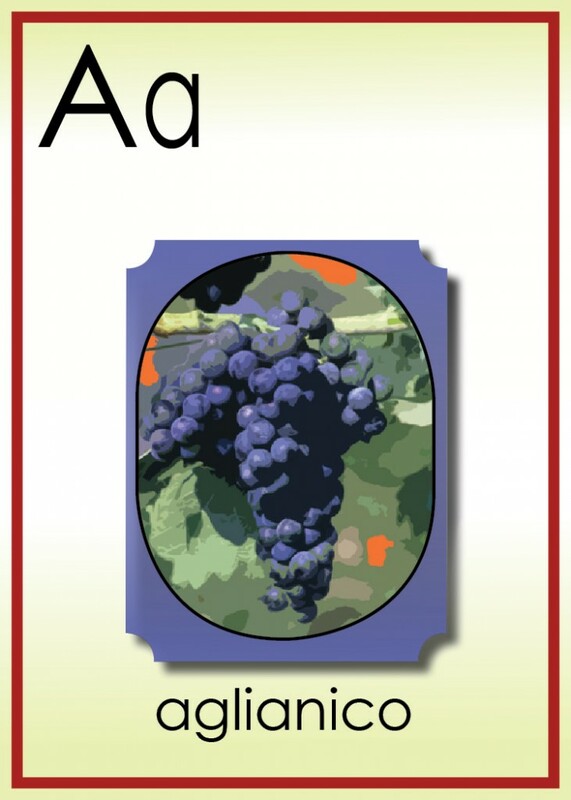 The posts that started it all…The Wine-Phabet: “A” is for Aglianico and “N” is for Nebbiolo. Can you believe I have never been to Italy? It is the “wine country” and I have never set foot there. My step-father who just passed away this past holiday was Italian. Actually Italian-American. His father and mother came to the USA as an Italian immigrants. His father worked in the insurance business in San Diego for fishing boats. His mother was a pianist and loved Italian operas. I heard many stories about Italy. I tasted many wines from Italy. As an Art major, I studied many pieces of Italian art. I have been through Holland, France, Spain, the Americas, Asia and Australia; but never Italy! Finally! I am Italy bound! Below are two of my favorite posts in reference to Italy. The Wine-Phabet started with Italy. I still remember the comments from my staff when I first posted it. It was refreshing to hear that they had actually read it. When I started the Wine-Phabet it got a sense of direction of where I wanted this blog to go. At first people told me I should write about all the wines I get to taste, but that felt like work to me. I wanted to have fun, I wanted to make fun. The Wine-Phabet allowed me to teach, joke around and strike people’s nerves. I always love striking nerves in the discussion section of my wine groups on Linkedin. Some people take wine way too seriously. The Aglianico post was fun in that I got to personify grapes and wines. It eventually led to love letters to grapes, Dr. Seuss of wine and interviews with dead celebrities. The second post comes at the wrong time. I never watched the fight and I don’t think I can watch Anderson Silva go out like that. 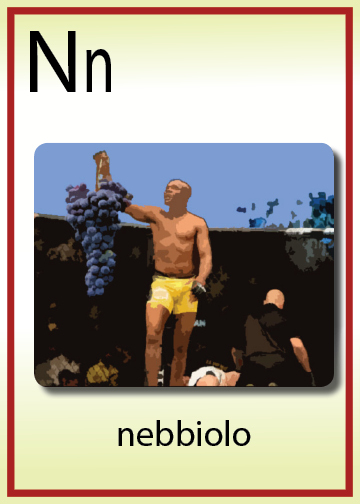 The letter “N” was de voted to Nebbiolo, the king of grapes and I compared it to Anderson Silva from the UFC, who at the time was the king of the ring. Since he broke his leg in two, that reign came to end. I still regard him as the king. I just hope that nothing ever happens to Nebbiolo. This trip I will be in Tuscany and Piedmont, so I won’t be tasting Aglianico, but I am looking forward to drinking a lot of Nebbiolo! I am sure that when I return I’ll have some other Italian wine bit to write. But now I got to go and catch my flight. “Gate 25 is boarding for Milan”. Ooohh, I just got a chill. Ci vediamo più tardi. Oh Campania! Italy’s finest region of the south is home to the Aglianico grape. One might want to address him as Signore Aglianico, because it is best to approach him with age. His wines are not for the weary at heart. Signore Aglianico is rustic, grippy and masculine! He is thick skinned and if not nurtured properly, he can be a miss-behaved outright bully. Signore Aglianico as a young boy might come across as a problem child, but put him in “time out” in a bottle and watch him mellow out. He tastes of black fruit, tobacco leaf, black tea and comes with a double spine backbone. Approach him with care, let him chill before you engage and his ill tempered youthfulness gives way to beautiful floral aromas.